Over time, I will be reposting the entries from my previous monthly blogs Back To Eventing and Back To Riding. This was originally posted on the USEA website Tue, 2010-09-21, archived here. 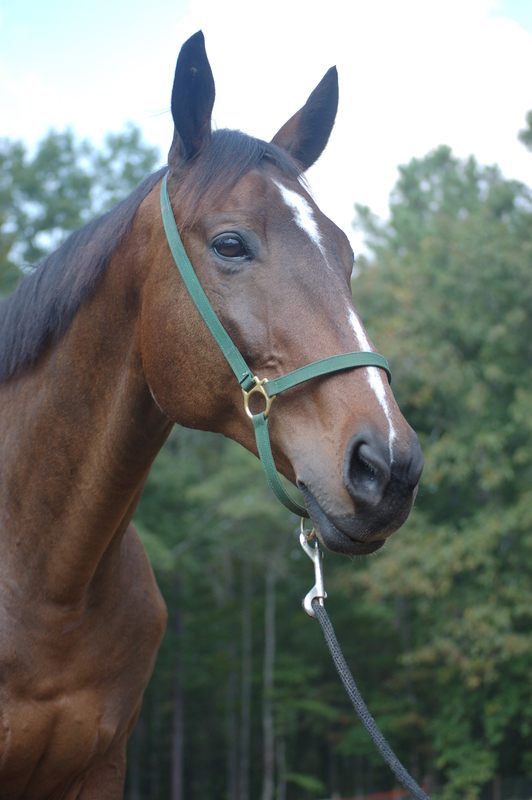 Roscoe* is an 11-year-old, 17.1-hand, bay, Thoroughbred gelding. No, that's not a typo. When he sees voices and hikes up those ears, he channels his inner giraffe. I became enchanted despite not because. He comes with buttons installed for jumpers and dressage, with the dial up to 10 for Likes to Jump. As I understand his life history, he has not hopped over so much as a twig outside the ring. Riders understandably dream about owning a big, fancy horse. Be careful what you wish for. There is nothing comfortable about being handed the keys to a Ferrari. Rode as a kid at summer camps and on a fat pony owned by a distant relative. Leased first horse in mid-teens. Earned a graduate B from Upper Valley (VT) & Potomac (MD) Pony Clubs. Rode in the Intercollegiate Horse Show Association. Learned that good looks and charm can cover a multitude of sins. Survived a short stint as a working student at an eventing barn. Learned that I did not want to do horses professionally. Owned three horses prior to Roscoe, most recently an off-the-track Thoroughbred who preferred jumpers. Beginner Novice – could and have kicked just about anything over BN, except my previous horse but that’s a post for another day. Novice – on a cooperative horse. Training – on a made horse. Preliminary – as a passenger. Intermediate or Advanced – not outside of a Star Trek holodeck. Picture me leaping off Previous Horse after a stellar jumper trip at an A-rated show. Stage left, my coach waves me back into the arena to watch the competition take my line – slower. I win! Pause. Where’s my horse? At last reckoning, he was standing in the breezeway. See me charge back out to find that my insert-adjective-here hubby has quietly taken the horse back to the trailer and is untacking him prior to hosing. Better than roses. 10	This time, you don’t send the video to all your friends for their opinion beforehand. 9	The seller has another horse who is cute, suitable, and perfect. You don’t even take him out of the stall. 7	You start to imagine how he would look in your pasture. 6	You superstitiously freak out when someone congratulates you before the fait is fully accompli. 5	You find previous horse’s Coggins in your brush box & don’t get weepy. 4	What was ugly on another horse becomes adorably goofy. 3	You find yourself at the grocery store making daily carrot runs. 2	You email his photo to anyone on your email list who might be remotely interested. 1	When he pitches a widget that would incite panic from a different horse, you laugh and tell him to get over himself. *We changed his name a few months later. Not scary so much as kinda depressing. I remember all the hopes I had back then. Your and me both. This wasn’t supposed to be my life.